Have your players wandered off the beaten path yet again? Didn't have time to map out that castle? Just open Seven Strongholds to find forts, castles, and other well-fortified locations, fully detailed and ready for insertion into your game world. * The Barrows: A concrete bunker allows a determined troop of gnomes to hold a bay the misshapen monsters of the subterranean world, intent on breaking through to the surface. * Castle Briar: A elven warlord protects his living castle from jealous rivals. * Gloom Keep: Under a sunless sky, grim-faced humans protect their senile, maddened deity from the world. * Old Mound Fort: An iron-age ditch-and-rampart fort, refurbished by halfling adventures, offers a way station for treasure-hungry dungeon explorers. * Steelface Point: An imposing dwarven fortress protects the mouth of a mountain pass from the orcish horde and its war machines. * The Perch: Keen-eyed bird-men zealously guard their domed lair, from which they oppress the area's population of "walkers" - their contemptuous term for flightless humanoids. * Uthront Fort: Ambitious half-orcs occupy a newly-built motte-and-bailey castle as an early stage of their effort to mold the local humanoid raiders into a mighty and unified army. 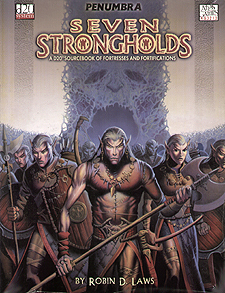 Like all Penumbra products, Seven Strongholds give you material adaptable to any fantasy campaign, whether it be a published setting or a world of your own creation.